If you have questions about our 200 Hour Teacher Training Program, please send an email to yoga-space@sympatico.ca for an immediate response. Yogaspace is a registered Yoga Alliance Teacher Training School and a Private Educational Institution certified with the Federal Government of Canada. Teacher training students will receive an official tuition fee receipt and an official education and textbook credit for income tax purposes. Students of our program receive a six month complimentary pass to all classes on our drop-in schedule (except Mysore classes) and must attend 20 classes throughout the duration of the pass. While the complimentary pass is unlimited, the objective is to complete the 20 compulsory classes, providing a class reflection for 10 of these classes before certification is granted. Detailed instructions will be provided upon program registration. Yogaspace has been training yoga teachers for 18 years. We offer Yoga Alliance Registered Trainings at the 200 and 300 hour levels. We also offer a Registered Prenatal Yoga Teacher Training. Successful graduates of the 200 hour program are eligible for RYT 200 status with the Yoga Alliance. Successful graduates of the 300 hour program are eligible for RYT 500 status and graduates of the RPYT program are eligible for RPYT status. We offer three, 200 hour Teacher Training program options annually. A four week Summer intensive, a 10 weekend Fall Program and a 10 weekend Winter program. All programs include a 6 month complimentary drop-in class pass, unlimited access to our private infrared sauna for $10 per session, (regularly $25), and free mat storage at the centre. The scheduling of our programs allows for a healthy, relaxed learning process, structured to meet the unique needs of individuals who work and and/or go to school full time. Our Summer 200 hour program is popular with public school teachers, University students and visitors from abroad. 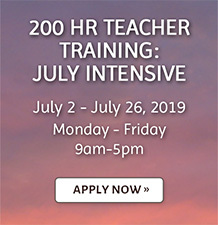 The 200 hour program is suitable for serious students with at least two years of yoga practice who have developed a passion for the practice of yoga and an interest in becoming yoga teachers. It is also an appropriate learning environment for serious students, interested in deepening their yoga practice but not necessarily wanting to teach. Our senior faculty members are recognized leaders in the Toronto Yoga community who have been teaching for over 20 years. They are eager students and educators of yoga, passionate about sharing their significant knowledge and experience. They are accessible to Teachers in Training while the larger Yogaspace teaching team also serve as mentors. The environment at Yogaspace is supportive, inclusive and friendly. Our 200 hour program offers in-depth training in Classical Hatha and Contemporary Vinyasa Yoga. We also offer specialty classes, drop in classes, and advanced training in Restorative Yoga, Therapeutic Yoga, Iyengar Yoga, Scaravelli Yoga, Flow Yoga, Kundalini Yoga, Pilates Fusion, Mindfulness Meditation and more. As a school, our approach is therapeutic and our emphasis is on function in relation to the individual rather than on aesthetics. We are interested in using the poses to explore the body rather than using the body to attain the perfect pose. We believe that the practice of yoga is beneficial to everyone and that a liberal approach to the use of modifications makes it accessible to anyone. 1. A strong theoretical and practical education in all aspects of yoga. 2. Student commitment to a personal practice as the foundation of creative teaching. 3. The experience that can only be attained through the practice of teaching, itself. The Yogaspace 200 hour teaching faculty is dedicated to graduating new teachers who are physically and mentally fluent in the fundamentals so they may begin their teaching journey with confidence and ease. The rest is up to each individual who embarks on the journey. With each group of students we work with, we witness the awakening of incredible passion, commitment and dedication as graduation draws near and the option of teaching community classes becomes imminent. Graduate certificates are issued upon completion of all course requirements and at the discretion of the Program Director. Successful graduates of the 200 hours program are eligible to register for the 300 hour program and/or the RPYT program. Our ability to provide a schedule that allows for a relaxed, healthy learning environment. Experienced, knowledgeable senior teachers with almost two decades of experience training Yoga teachers, each. Our program is 18 years old and has graduated some of Toronto’s most successful yoga teachers and studio owners as well as individuals teaching in locations all over the world. An extensive public teaching practicum where students develop both skills and confidence in a supportive environment before embarking on a teaching career. Limited enrolment allowing for individual attention and ongoing contact and email support with primary teachers. We take a maximum of 20 students into our program. Many programs in Toronto take as many as 40 students into a single program and we know of retreat trainings that take as many as 100 students. A 6 month unlimited drop-in class pass that can be started upon payment of your $500 registration fee. Yogaspace 200 Hour Teacher Training Manual. One Without a Second, by Hali Schwartz (philosophy text). Private consultation with program director to set goals. Option to teach ongoing community classes on the Yogaspace drop-in schedule and receive peer feedback. Contact and e-mail support with primary teachers. Lifetime discount on drop-in class passes. See our fee page for details. 20% off all retail products at The Yogaspace Boutique. 10% off your first treatment at The Yogaspace Wellness Centre. Unlimited, $10 private infrared sauna sessions. (regularly $25 per session). All textbooks and materials included. Please note: 100% attendance is mandatory in order to obtain certification. Classes missed may be made up in subsequent programs with permission from the Director. Applications will be accepted until the program is full. Applicants receive a 1 week unlimited complimentary drop-in class pass that will be activated upon their first visit. Admission is on a first come first served basis. Space is limited. We suggest you apply early. Tuition is $3000+hst and includes unlimited drop-in classes for 6 months. The Fall and Winter programs run over 10 weekends, comprised of 15 hours each. The Summer program runs Monday – Friday, 8 hours per day for 4 weeks. Students must also attend 20 classes during the 6 month complimentary drop-in class pass period with assigned faculty teachers and write a short reflection on 10 of these classes to be handed in on program completion. There will be no extensions on the 6 month pass. Students who do not complete their 20 classes within the 6 month period must purchase drop-in classes to do so. Students have the option of teaching Community classes on our drop-in schedule upon program completion. Applications will be reviewed as soon as they are received. A $50 application fee must be received at the time of application. Once you have paid the application fee and submitted your application, a complimentary 1 week pass will be put on your account. This pass will be activated upon your first visit. Please make sure to take at least one class with the program director, Kathryn Beet. Please introduce yourself as a teacher training applicant before the class begins. A $50+hst application fee must be submitted at the time of your application. Applications not accompanied by the application fee will not be accepted. The $50+hst application fee can be paid online (below), in person at the front desk or by calling 416-516-9940. Applicants to our Teacher Training Programs receive a 1 week unlimited complimentary drop in class pass.